Looking To Buy A Photo Booth Kiosk? MVS Studio has developed, built, and installed several photo booth kiosks for clients over the past few years. A few years ago, we were contacted by New York Public Library. 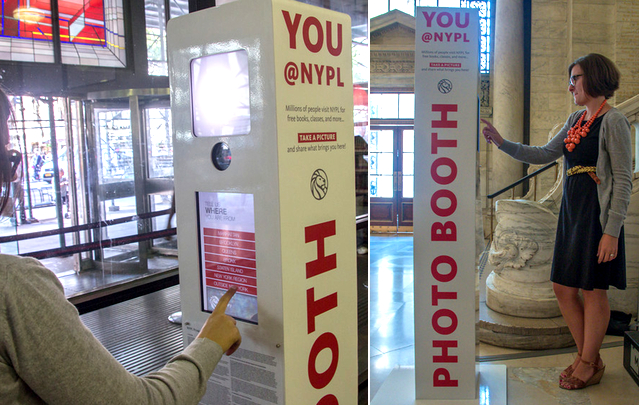 An executive for NYPL had seen one of our permanent booths at a Brooklyn Nets game, and wondered about the potentials of “selfies” at the Library. NYPL was looking to boost their social media profile while creating a unique image based consumer engagement. We programed the booth to ask several leading questions: visitors name, reason for visiting and borough. Images are shared via email and onto visitors’ favoirte social media sites, in addition to an instantly updating Flickr site. In the past two years, the installation has been a tremendous success for the library, generating initial press and continued customer engagement. Since then we have worked with Grey advertising agency to install a Photo Booth Kiosk in their lounge, and with CBS This Morning to install a modified Photo Booth Insert in their guest greenroom. Each client has different needs for social, printing, and display and we have found great solutions to mazimize impact. As with all MVS Studio projects we hold high our standards for the look of the equipment, attaining the best image qualiy and achieving a seamless user experience. Do you feel as if you can engage with your audience in a different way by installing a permanent photo booth? Contact us today, we would love to help you engage with your audience and grow your brand!